Duncraft's Songbird One Way Mirror Window Bird Feeder brings the birds up close. You can sit in your living room or stand in your kitchen and watch birds feed from just inches away. 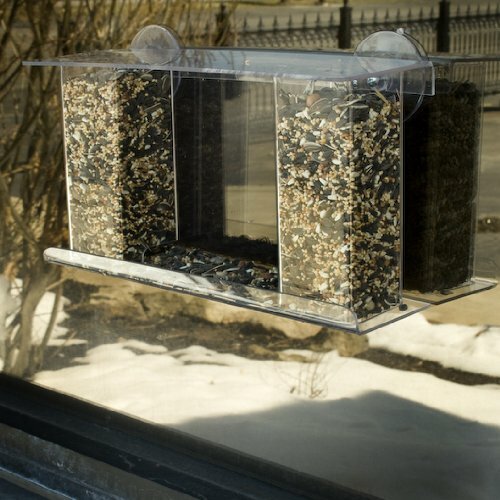 Two heavy duty suction cups secure the feeder to any window. Two columns hold 1-pound of seed and a one way mirror film will have birds prancing and preening. The mirror sits between the two columns and blocks birds' view into your home. The birds won't be scared off because they won't know you're watching them. The feeder is super easy to clean and fill and the clear plastic keeps seed levels visible at all times. You can use multiple seed types to keep birds interested and to attract a variety of species.